Its true, build a railroad and towns will spring up! At least it was true in 1872 when Fishers came to be. Along side the Nickel Plate Railroad that ran from Indianapolis to Chicago. That same railroad still runs today. 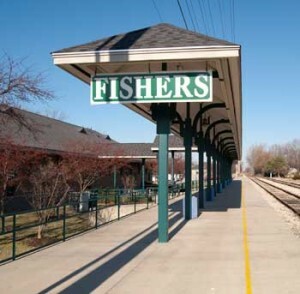 You can grab the train in Fishers and ride to the Indiana State Fair. If you prefer, Friday nights you can ride the train to dinner, with an open bar. If you're dining in Fishers be sure to try the Nickel Plate Diner. Where else would it be besides next to the Nickel Place Railroad? Don't think Fishers is stuck in the past. Fishers is well acquainted with Money magazine, they have placed anywhere from 33rd to the 8th of best places to live for 2005 to 2010. The Learning Channel named Fishers the #1 best place to live for families in 2011. If you want to live on the water but commute to Indianapolis then you need to consider the Geist area. Annexed into the Town of Fishers in 2008 the Geist area has some of the most expensive real estate in the Indianapolis area. Geist Reservoir is approximately 1900 acres of water, with a depth of 10 feet. In the evening you can see 10 to 20 boats gathered together for an on the water party. It's a busy place on those hot summer days, or maybe the 4th of July Fireworks on the water is your thing. Either way you won't be disappointed. Anywhere you live in Fishers you'll be served by some of the best schools Hamilton County has to offer. You can either attend Fishers Schools or Hamilton South Eastern Schools, which combined, have an 85% rate of graduating students attend a 4-year college.